We've set out a summary of terms that we refer to in this web site. Don't forget that if you talk to a police officer and they say "that isn't correct you need to have received this or that", they will be talking about their Constabulary's procedures and not the law. The Association of Chief Police Officers. This body is a "steering committee" of senior police officers that produces guidelines on how each Constabulary should operate. However, ultimately it's down to the individual Chief Constable of each Constabulary to set his own procedures, and that's why there is substantial regional variation in police procedures across the U.K.
For your information, we have an extract from their guidelines on the use of time and distance measuring equipment and this link will take you to the latest version of the ACPO Traffic Enforcement Guidelines in PDF format (1.56 MB). Police patrol cars are fitted with very accurate speedometers and it's perfectly acceptable for the police to use them to measure your speed. Please note that they must be following you and maintaining a constant distance. The example that we have is from the start and finish of a half-mile "follow check". You'll notice that the "target vehicle" has got much larger in the right hand picture. This is why it's so important to get the officers to explain the evidence to you at the time. Don't just assume that they know what they're doing - take a look at this officer's statement! "You do not have to say anything but it may harm your defence if you do not mention now something you later rely on in court, Anything you do say may be given in evidence." They're far less underhanded than the verbal NIP, but the caution is not mandatory - see PACE. The Crown Prosecution Service. This is the body that is supposedly "independent" of the police which prosecutes you on their behalf. We've no evidence that they are independent. Under the law any evidence that the CPS is going to use to prosecute you must be made available to the defence prior to the trial so that they can prepare. The police collect evidence on behalf of the CPS, but that evidence becomes the property of the Crown when you're to be prosecuted. As a taxpayer you're entitled to a copy of the evidence (traffic video), so we explain how you can request a copy even if you've already been convicted. This is exactly what it says. It's when the patrol car is following you and measuring your speed. Some Constabularies instruct their officers to conduct a one mile follow check, but under the law that isn't strictly necessary. Again, get them to explain their procedures to you. 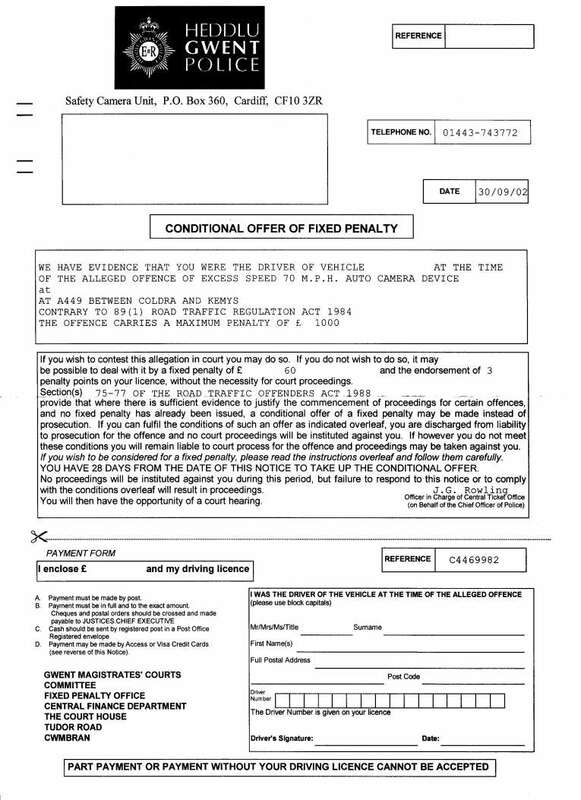 The Fixed Penalty Ticket or FPN is a conditional offer made by the police. It's the minimum punishment for a speeding offence and attracts 3 penalty points a £60 fine. If you've received a ticket from a speed camera you need to check it very carefully because the FPN can be issued up to six months after the alleged offence, unlike a standard NIP which must be issued within 14 days. This link will show you an example of an FPN from Gwent police. The Magistrates' Court is the most junior of all Courts - and the one that provides the most local service. All criminal cases begin before Magistrates (Magistrates were first appointed by the Justice of the Peace Act, 1361). All speeding offences are handled by Magistrates' Courts, and if you'd like to know more about these courts follow this link. Most Constabularies send them out within 14 days of the alleged offence - even if you were spoken to at the time by a police officer (see verbal NIP). They're usually sent by Recorded Delivery. For more information please follow this link to our NIP page. These are very important, and cause most of the confusion because different Constabularies' procedures can be totally different. 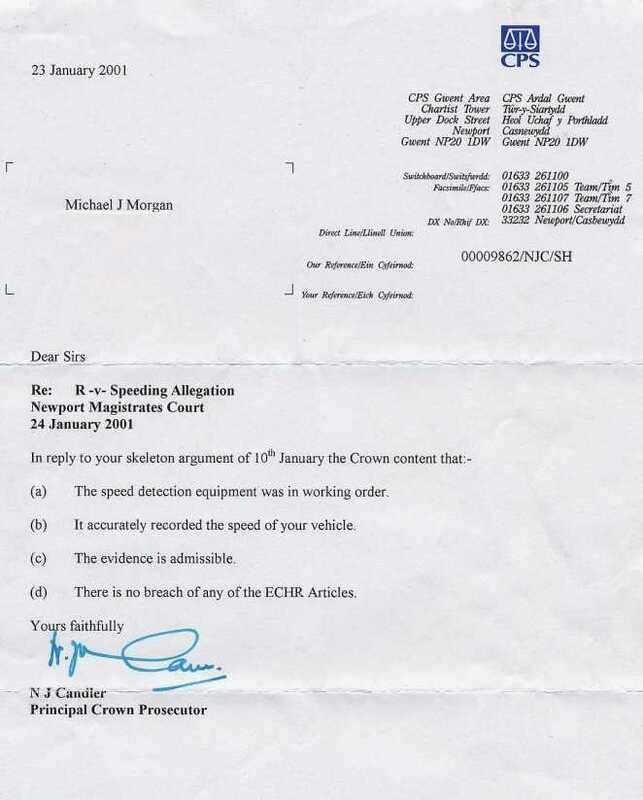 The legal minimum relating to speeding doesn't require many of the things outlined in individual Constabularies' procedures. This is why it's very important that you ensure that the officer who stops you clearly explains his Constabulary's procedures to you. This document outlines the defence's case in words that legal people like to use, and forces the prosecution to respond with it's case. You're guilty of speeding once you travel at 1 mph over the posted speed limit, and for that reason the police refer to it as an "absolute offence". If a police officer tells you that they won't pull you over on a motorway at under 85 mph that's either their personal opinion or the policy of their constabulary. This is why they won't need any changes in legislation to introduce "zero tolerance". Under the 1980 Magistrates Court Act this is required to accompany a summons and summarises the alleged offence. However, it's perfectly acceptable for a police officer's statement to form the only "statement of facts". This is how the police refer to the vehicle they are following. If they stop you it was your vehicle. VASCAR (the most commonly used). Police officers have to be trained in their use, but it's possible to manually check the speed they say by using the traffic video. Don't forget that modern car speedometers are very accurate, and if you think they got it wrong we can help you. Patrol cars in the UK are now fitted with video recording equipment which records what happened. It records lots of other data in addition to the basic video. We can use the video to very accurately calculate your speed. "You will be reported for consideration of the question of prosecuting you for this offence." Although there appears to be need for "consideration" and a "question" to answer you may never hear anything else from the Constabulary before you get a court summons. Make sure that if you've anything to say for yourself, you say it after the verbal NIP. If a verbal warning is given at the time, it must be shown that the defendant understood it (Gibson v Dalton ). Proof that they understood the charge will lie with the prosecution. This section of the ACPO guidelines suggests that there's no actual legal right to view the evidence when you're stopped - point "12, (h)". However, make sure that you take the time to study the evidence. Explain that you may need a copy of the traffic video for independent verification of your speed. Even if they don't like that it isn't up to them, as the evidence becomes the property of the Crown when you're prosecuted - see Disclosure.